^ The device remotely accessing my school laptop. Note how windows can be run on the phone fairly easily. The background is a Rainmeter layout. 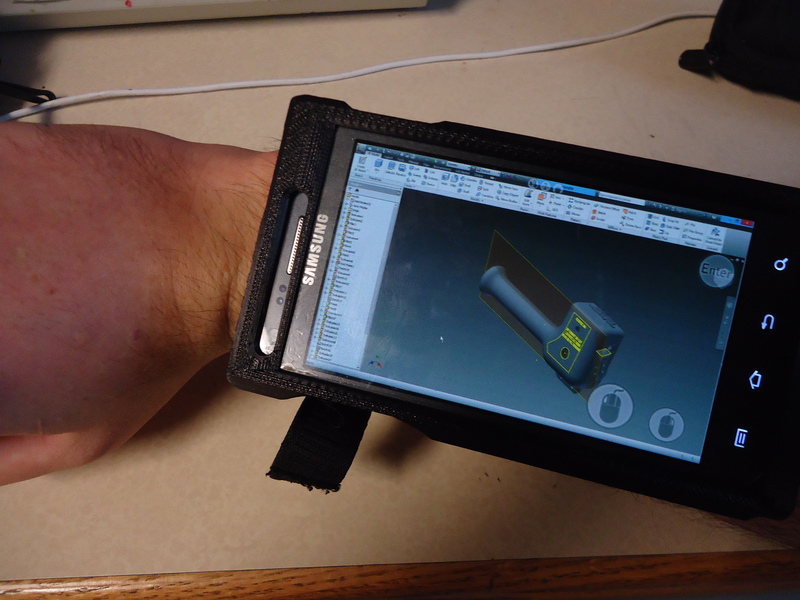 ^Running Autodesk Inventor over Kainy. Autodesk Inventor, CatalystEX, Kainy, Additive Manufacturing, Basic Mechanical Engineering. 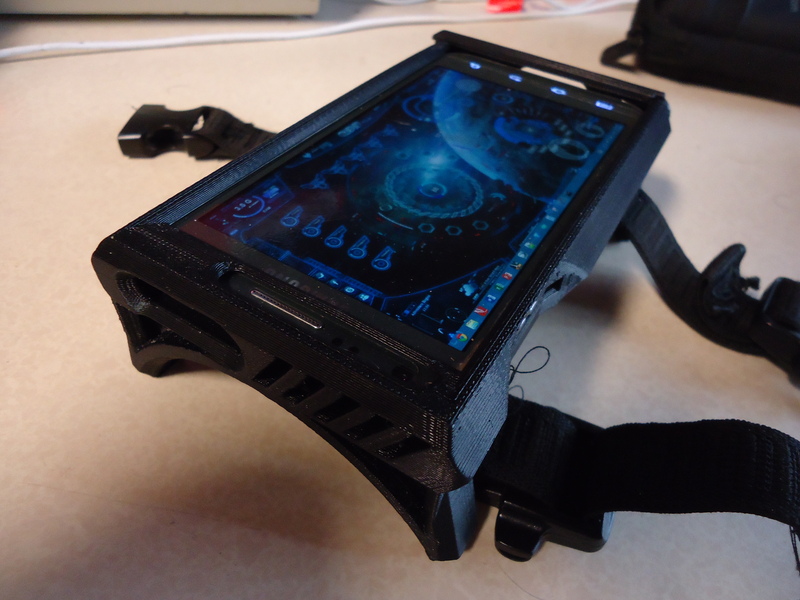 Based off of the success of my original 3D printed wrist mounted cell phone case (whew, that’s a lot of words. Let’s just call it a 3DPWMCPC), I decided to fix some of the errors in the old version and add some new stylings and features. While it is still sized to fit a Samsung Galaxy SII, the first major difference in the 3DPWMCPC is the case itself. For starters, I fixed the placement of the slot in the top to fix correctly, and put a larger hole in the slider to accommodate larger chargers. I also replaced most of the fillets with chamfers in an attempt to make it look more masculine and sleek, and printed it in black for this same reason. The pictures do not do this work justice, and you will need to look at the CAD files to see it properly. One of the biggest overhauls to the system is actually the addition of a certain software called Kainy, developed by Jean-Sebastien Royer. The software allows remote access and control of computer systems via a cell phone over WiFi. Also, unlike many remote access systems, it provides a direct link to the computer screen, as opposed to just the files. With the additional facts that Virginia Tech has WiFi all over the campus, the capabilities of Google drive, and the ability to leave all of my computers on permanently, I have complete control of all of my computers at any time, (given that I remember to leave them on) from my wrist. 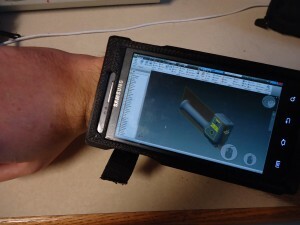 So far, I have used this technology for fun little things like playing Halo: CE, adapting a part with Autodesk inventor and uploading to Google Drive, using it as a clicker for PowerPoint presentations, and moving files that I left on my desktop computer to Drive so I can access them on my laptop. The potential is practically endless. Still a cool idea and one of the most useful things I have created to date, as I have used it on a daily basis. 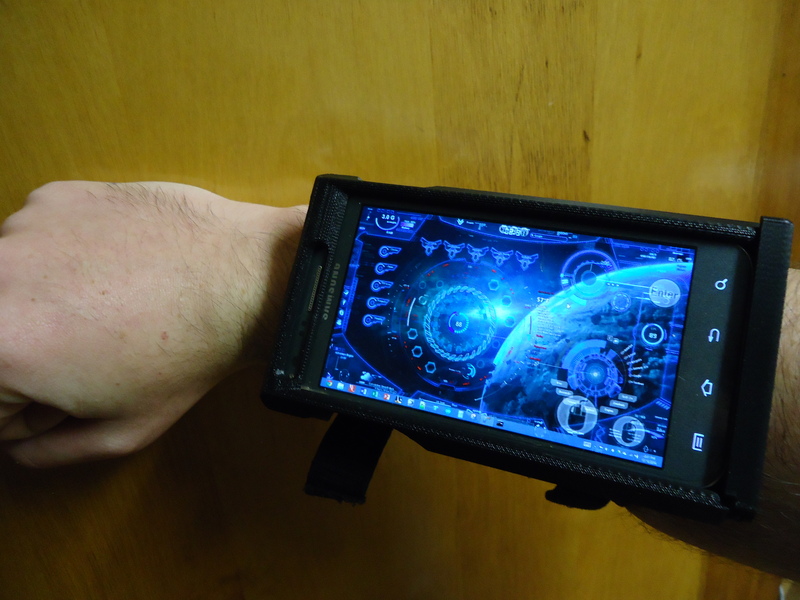 I can access all three of my computers from my wrist from anywhere in the world, so long as I have internet access. It looks really cool, and I have been noticed by a large sum of people because of it. Kainy saps battery like crazy, and I have seen a drop in battery life since its implementation. Changing the fillets to chamfers created a number of points, which poke the user on occasion. I have been dying to get a new phone, and when I do, I will have to hit it with the vernier caliper again to get the measurements right. Once I get that, I want to attach a solar charger and a portable power pack to counteract the power drain by Kainy. This has been one of my best inventions, and I am just making it better. Looking towards the future, I am trying to make it better, but it is almost what I want. The ReCorp: Restoring the oldest 3D printer… With Glam.